It’s SALE-A-BRATION CELEBRATION, with the new Blogging Friends Blog Hop! Welcome to our March blog hop, where we are having a SALE-A-BRATION CELEBRATION! The first 3 months of each year are always fun, because it’s time to get FREE products! This year is no different, with so many fun products to choose from. Since there are so many to choose from, this hop we’ll each be sharing our favourites. In case you haven’t taken a blog hop before, this is how it works. Each blog is linked to the one next in line, so all you have to do is keep clicking on the ‘Continue’ button at the end of each post, and you’ll go all the way through all of the participating blogs. Easy peasy! This stamp set was one of the first sets I ordered! Here in Vancouver, with our generally mild weather year-round, you can always find food trucks, with the most tasty dishes! This is such a fun set! You can change it up to be a hotdog or taco truck, as well as the cupcakes. 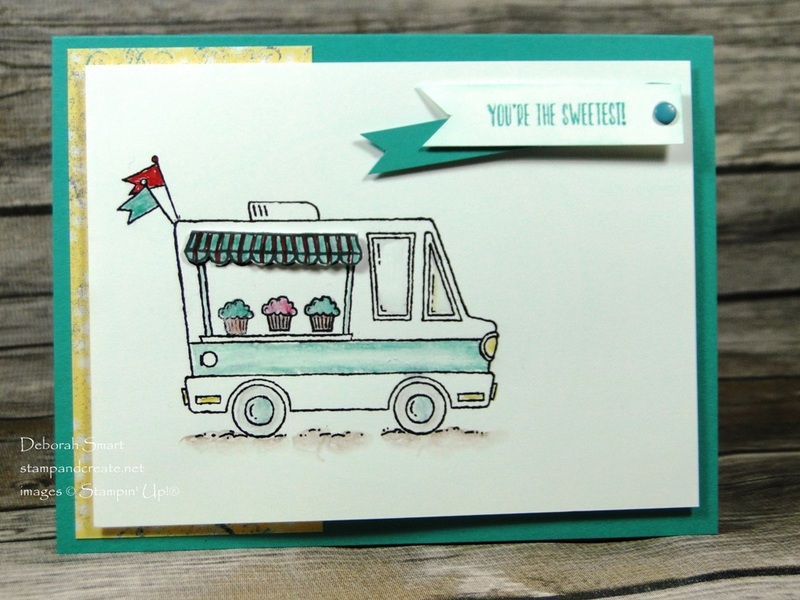 The truck, cupcakes and flags are stamped on a panel of Whisper White cardstock in Archival Black ink. 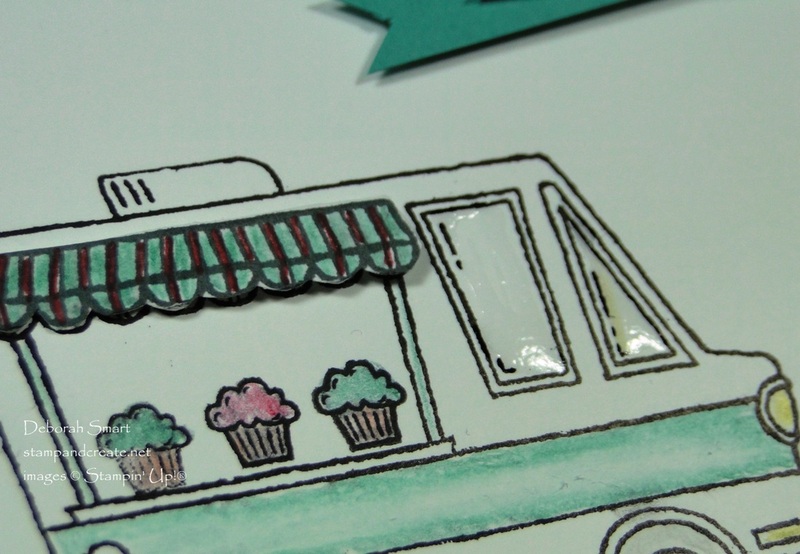 I stamped the awning a second time on a separate piece, and added it to the truck with Mini Glue Dots after colouring it with the Bermuda Bay Watercolour Pencil and Real Red Stampin’ Write Marker. It gives the truck a fun 3D look 🙂 The rest of the colouring is done using the Watercolour Pencils and a Blender Pen. I chose to use Bermuda Bay, Melon Mambo, Real Red, Early Espresso, Basic Gray and Daffodil Delight. Thanks for sharing that tip, Buffy! I think it looks really cool – and in person you can feel the smooth texture, too. I may go back and add some to the icing on the cupcakes! Do you think you have enough floral stamp sets? Well, think again! 🙂 The lovely Avant Garden stamp set, available only through Sale-A-Bration, should be on your list. To show you how gorgeous this set is, I decided to copy a sample that is in the Sale-A-Bration brochure. Starting with a panel of Whisper White cardstock, I stamped the watercolour floral image 4 times; twice each in Peekaboo Peach ink and So Saffron ink. Stamping half of them upside down makes it appear to be a bouquet of flowers. The leaves are then added in Pear Pizzazz ink. 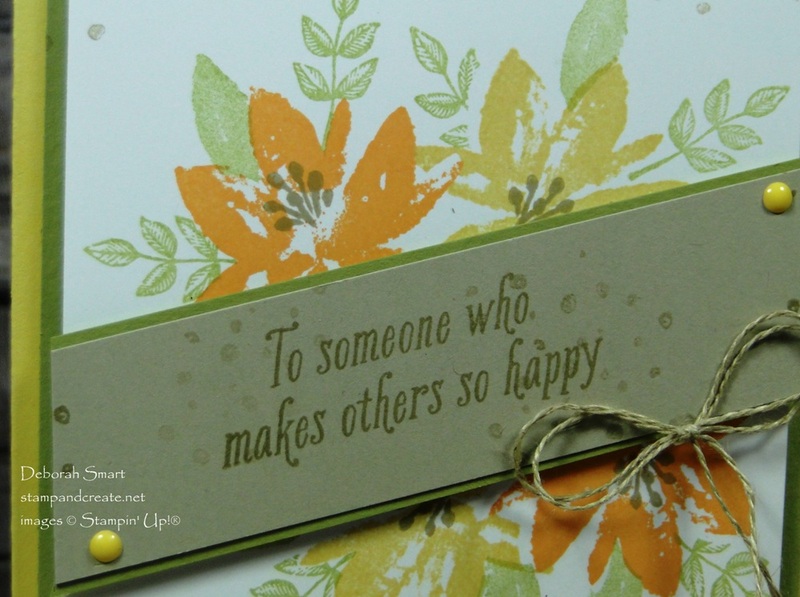 The sentiment is stamped onto a length of Sahara Sand cardstock in Sahara Sand ink. I decided to add some of the dots to the sentiment piece, as well as the floral panel. Adding these dots, the Subtle Colour Candy Dots and the extra layer of Pear Pizzazz cardstock is my way of taking the sample card, and making it more my own. Instead of the Crushed Curry Baker’s Twine that is in the sample, so I chose the Linen Thread for the bow. I’d love to read your comment on what you like best about Sale-A-Bration, my cards, and what are your favourite free products! Next, you’ll want to click on the Continue button below, to carry on with the rest of the Sale-A-Bration Celebration blog hop. Have fun, and enjoy the creative projects! Next Next post: Tic-Tac-Toe Challenge – Which Row Will You Choose? I love the tip for the “glass”! Really fun! TFS! Super Cool cards Deb! Love the Glass windows on the truck! So glad you’re back this month! I love your cards Deborah! That is such an awesome tip on using the Fine Tip Glue Pen on the windows like that. Great tip for making the “glass” — thanks for sharing! Great card! Oh cool tip to use the fine tip glue pen – kind of like the old Crystal Effects! I’ll have to remember this idea. The Fine Tip Glue works out pretty well as a replacement for the Crystal Effects, Crystal! Glad you liked my projects. Tasty Treats is one of my favorites from sale a bration. I love it. I wish it could carry over!! !Love your cards!!! As always cute! !